The Automation and Enterprise Automation editions of BarTender must contact Seagull License Server (SLS) for printer license authentication. If Seagull License Server cannot be contacted, BarTender enters a grace period which allows you to continue printing for up to 72 hours from the last time that SLS was contacted. At the end of the grace period, or if BarTender has never contacted SLS, BarTender will not print or export any labels or documents until the issue is corrected. "Attempting to connect to Seagull License Server. Please wait..."
Message 1405, 4402 -- The Seagull License Server was not found. You must install and activate Seagull License Server on your network in order to use this product. The BarTender installer includes License Server as an optional component, and it can be installed on the same computer as BarTender. If BarTender will be used from multiple clients, License Server should be installed on a central server that has high availability and is accessible to all clients. For more information about License Server, please see the 'Licensing for Automation Editions' whitepaper. Message 3405, 3406, 304005, 304013, 304015 -- BarTender cannot locate the Seagull License Server. You must install and activate Seagull License Server on your network in order to use this product. The BarTender installer includes License Server as an optional component, and it can be installed on the same computer as BarTender. If BarTender will be used from multiple clients, License Server should be installed on a central server that has high availability and is accessible to all clients. For more information about License Server, please see the 'Licensing for Automation Editions' whitepaper. The network’s integrity is compromised and BarTender’s communication with SLS is lost. Either BarTender or SLS is not set up properly to communicate with the other program. Common causes for this include mismatched ports or an incorrect IP address. 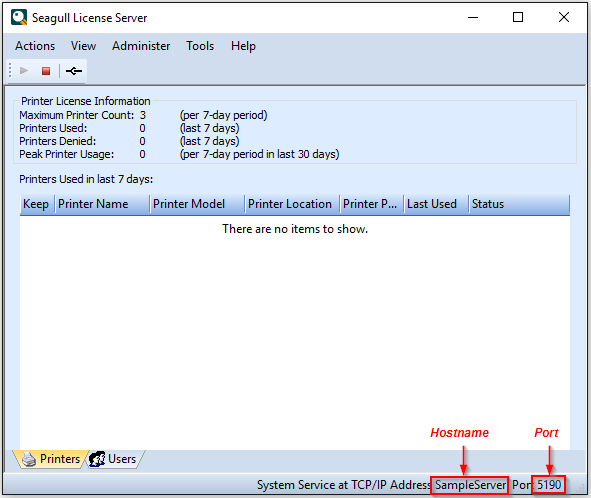 If you are working with a new installation of the BarTender Suite and Seagull License Server has never been installed, then you will need to choose a computer to install it on. Every instance of BarTender on the network needs to connect to SLS in order to print, so it is usually best to install SLS on a server, however, it is possible to install and run SLS on a desktop. If the ping times out, then there is no connectivity between the computers. You will need to address the connectivity issues with your network administrator. Once you have verified that the PC hosting BarTender has communication with the PC hosting Seagull License Server, you will need to ensure that BarTender is looking for SLS on the correct host and port. Open SLS to view the host name and the port it is currently using. 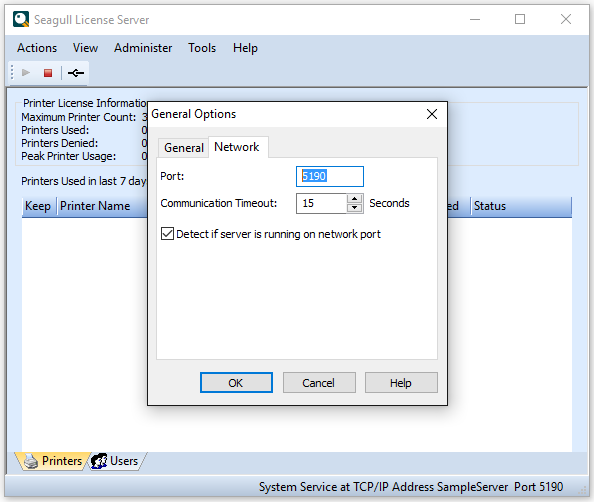 To change the port that SLS is running on, from the Seagull License Server Tools menu, select General Options and click on the Network tab. From here you can manually change the port. The default port for BarTender and SLS is 5160. Next, check which port BarTender is using to attempt to connect to SLS. From BarTender's Administer menu, select Licensing Setup to view the port. 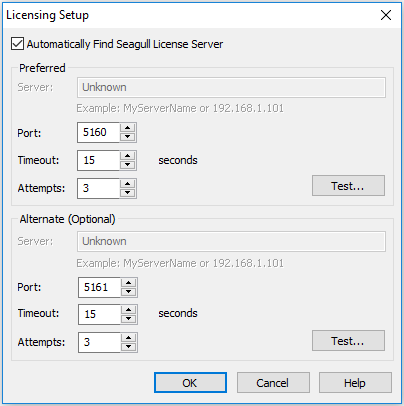 If the port settings are correct, deselect (uncheck) Automatically Find Seagull License Server and manually enter the IP address or host name of the computer hosting the SLS. 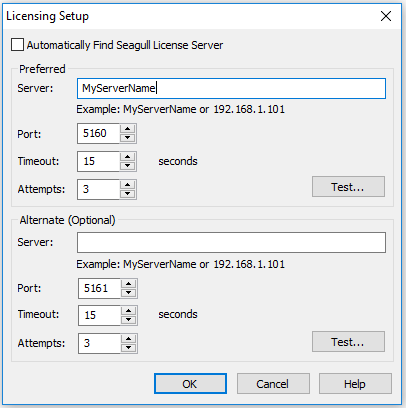 Note: BarTender will not automatically find Seagull License Server when crossing subnets such as routers and switches. For these situations you need to specify either the IP address or the host name of the computer that is hosting SLS. Check the firewalls (including the Windows firewall) on the BarTender PC and on the Seagull License Server PC. If they are running, temporarily disable these firewalls for testing purposes. If you discover that BarTender can find SLS with the firewall(s) disabled, you may need to make an exception in the firewalls to allow BarTender and SLS to communicate. BarTender uses the UDP protocol to communicate on the port that you previously specified. The default port is 5160. There may be a version or edition incompatibility between BarTender and SLS. Ensure that your installation of SLS has the same version and edition number as the BarTender installation or higher. In order to successfully communicate, SLS must not be an older version or a lower edition than BarTender. If the issue persists, open a ticket with Technical Support.